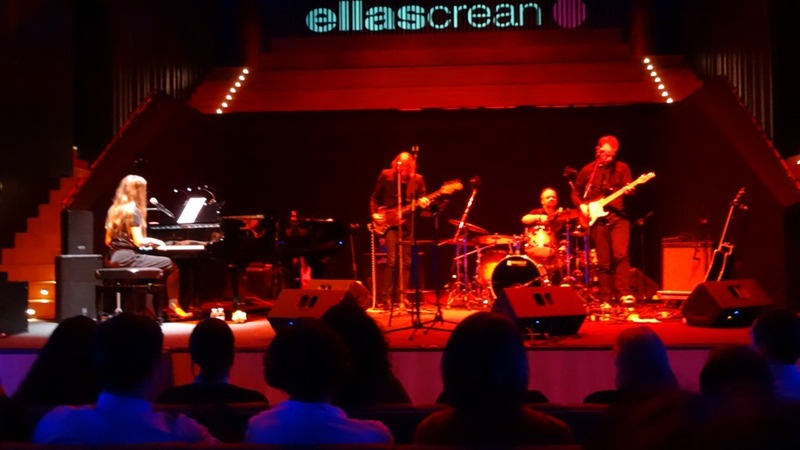 I hadn’t seen Rebekka live for quite a while until yesterday’s concert at the Conde Duque in Madrid and I was truly surprised having forgotten how great a performer and songwriter she is. Rebekka performed with a quartet she hadn’t played with for about 2 years, but still the musicians Børge Pedersen – Øverleir (guitar), Rune Arnesen (drums) and Lars Danielsson (bass) seemingly enjoyed the evening and playing together again. Arnesen, known for his works with Nils Petter Molvaer among others, is a drummer for all emotions, Pedersen- Øverleir a guitarist who can play anything and rocks amazingly when needed, all given a steady and intelligent heartbeat by Danish bass player Lars Danielsson – and Rebekka is holding all this together with her amazing voice and confident stage performance. 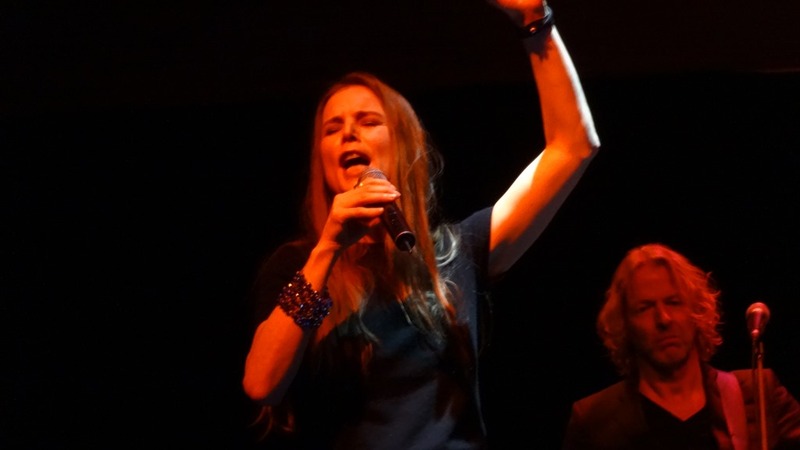 She played mainly her own songs, as her latest record of Tom Waits tunes is a Big Band album, but she still performed three powerful tracks from that recording, including the title track Little Drop Of Poison. The rest came from her other 5 discs, released over the course of 12 years since her amazing first album The Art Of How To Fall (2003) and two very new songs she wrote recently. What is truly incredible is that she jumps from Tom Waits to her own material and from a quiet and touching ballad into a rocker like Powder Room Collapse, reminiscent in groove and power of performance of Janis Joplin, to a hauntingly beautiful Norwegian song; starting alone, then building up with sound created by all musicians and ending in something Pink Floyd would have been proud of. Sometimes starting a song simply accompanying herself on piano, which she is playing very well, then the rest of the band coming in and taking the song where it should go emotionally. With a voice of the quality she has and the control she displays, it is no wonder that she can make you smile or cry or just listen in wonder about what she is able to do with her instrument. Is what she does jazz and is she a jazz singer? Who honestly cares? She is a great singer and songwriter. Period! If you get a chance to see her perform, not matter what band she is playing with, just go – you’ll be amazed about the musical variety presented, which is all part of the artist Rebekka Bakken. No doubt, Kurt Elling is the most amazing jazz singer around today, despite Andy Bey, Gregory Porter or Jose James and many others … but Kurt can not only interpret the standards like a only a few, but his way of vocalising soli from known songs and artists is second to none. In the concert at the Auditorium Nacional in Madrid on March 7th he proved again that he is in a class of its own: starting the show with an unaccompanied solo and then moving into Come Fly with me, only to go afterwards straight into the Marc Johnson song he wrote lyrics over the guitar soli of the original, Samurai Cowboy. This is followed by U2’s Where the streets have no name …..a weird mix in any book, but with Kurt Elling it all makes sense, as it is driven by his musical understanding of a song and his very personal interpretation and he is supported on this tour by a group of musicians who share that understanding: Gary Versace on piano and Hammond B3, John McLean on guitar, Clark Sommers on bass and Bryan Carter on drums. He then goes into the music of his forthcoming album, Passion World, a collection of love songs from various countries, sung in English, German, Spanish, Polish …. And in Madrid obviously the Spanish one did get a great reception. Where Love Is, a song based on a poem by James Joyce, is a true gem in this collection, of which we only heard a part, but enough to look forward to the release of the album in May/June. And he was testing the waters with some completely new music – using a Jaco Pastorius song this time to write lyrics over the solo – it sounded already great, but will just get better the more this band will play it. 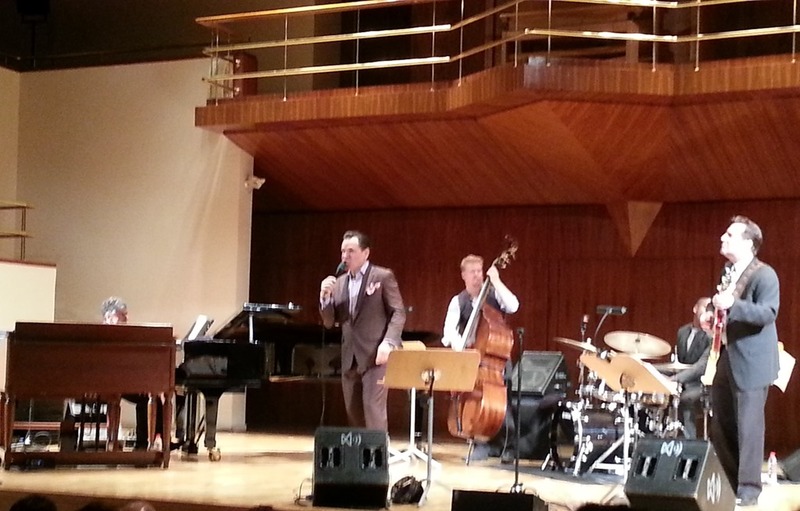 A happy and enthusiastic audience was rewarded with 2 encores and left smiling – nothing compares to the art of Kurt Elling! 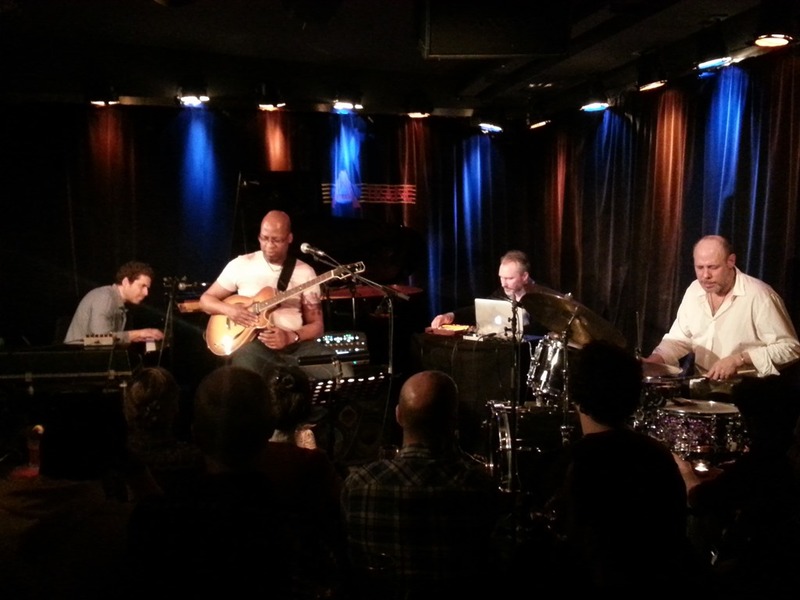 Currently on tour in Europe – the Jeff Ballad Fairground and so I went to see them at the A-Trane club in Berlin. A band that consists of Ballard on drums, Lionel Loueke on guitar, Kevin Hays on keyboards and Reid Anderson on electronics can’t do much wrong and even on their first night out as a band, they sounded amazing: careful sonic explorations with Ballard’s sensitive percussion driving the music forward, little themes popping up and disappearing, searching what this band could sound like. Loueke sometimes adding just sounds to the soundscapes of Hays and especially Anderson, who on occasion adds beats to drive the exploring further into rhythmic territories … with a smiling Ballard following happily. It seemed the band was working from kind of sketch sheets, developing the music while playing and coming up with new ideas, going around unexpected corners. There were some freer elements, which you would expect by musicians of this calibre improvising, but there were great beautiful melodic parts and a wonderful tune sang by Kevin Hays. Jeff Ballard’s Fairground are still touring Europe until the end of the month … and I am sure the shows will get even better than the already amazing first gig was. Go for your ride on the Fairground – no regrets guaranteed! !